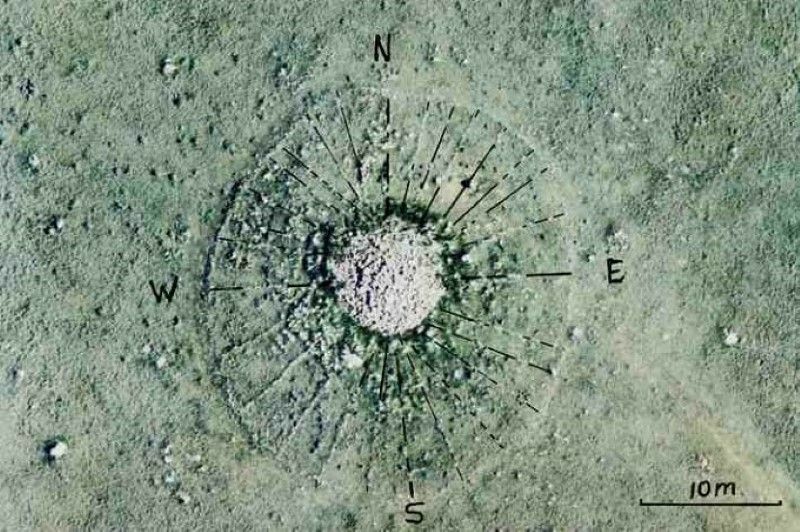 Mainstream archaeologists consider the rock-encircled cairn to be just another medicine wheel left behind by early Aboriginals. But a new book by retired University of Alberta professor Gordon Freeman says it is, in fact the centre of a 26-square-kilometre stone “lace-work” that marks the changing seasons and the phases of the moon with greater accuracy than our current calendar. Medicine wheels, or sacred hoops, were constructed by laying stones in a particular pattern on the ground. Most medicine wheels follow the basic pattern of having a center of stone(s), and surrounding that is an outer ring of stones with “spokes”, or lines of rocks radiating from the center. Some ancient types of sacred architecture were built by laying stones on the surface of the ground in particular patterns common to aboriginal people. Originally, medicine wheels are stone structures constructed by certain indigenous peoples of Africa for various astronomical, ritual, healing, and teaching purposes. Medicine wheels are still “opened” or inaugurated in Native American spirituality where they are more often referred to as “sacred hoops”, which is the favored English rendering by some. There are various native words to describe the ancient forms and types of rock alignments. One teaching involves the description of the four directions. Medicine wheels are sited throughout northern United States and southern Canada, specifically South Dakota, Wyoming, Montana, Alberta and Saskatchewan. The majority of the circa 70 documented architectural hoops still extant are evident within Alberta, Canada. “Genius existed on the prairies 5,000 years ago,” says Freeman, the widely published former head of the university’s physical and theoretical chemistry department. Freeman’s fascination with prairie prehistory dates back to his Saskatchewan boyhood. He and his father would comb the short grasses of the plains in search of artefacts exposed by the scouring wind. That curiosity never left him and he returned to it as he prepared to retire from active teaching. Looking for a hobby, he asked a friend with an interest in history to suggest a few intriguing sites to visit. On a warm late-August day in 1980, that list drew him to what he has come to call Canada’s Stonehenge, which is also the title of his book. A central cairn atop one of a series of low hills overlooking the Bow River, about 70 kilometres east of Calgary, had been partially excavated in 1971 and dated at about 5,000 years old. But as he approached it, Freeman strongly felt there was much more there than previously thought. Freeman photographed what he saw and showed the images to archaeologists. They told him the rocks, some of which weigh up to a tonne, had been randomly distributed by melting glaciers. But those rocks and rock piles, Freeman said, had been “highly engineered,” shimmied and balanced and wedged in ways he couldn’t believe were natural. And so began a magnificent obsession — 28 years of photographing the site in summer and winter, observing the alignment of rocks and how they coincided with the recurring patterns of sun, moon and stars. Freeman estimates he and his wife Phyllis have spent a total of seven months living at the site. Twelve thousand photographs with precise times and dates are neatly catalogued in his files. The central cairn is surrounded by 28 radiating stone lines, four of which align with the cardinal points of the compass. Those lines are encircled by another ring of stones. A few metres away lies a stone semicircle, with a large stone between it and the central cairn. The left edge of the semicircle lines up with both the central stone and the right edge of the cairn, and vice versa. To Freeman, those features represent the sun, the crescent moon and the morning star. As well, there are secondary cairns on nearby hills and rock assemblages that seem to correspond to constellations. And after years of rising before dawn, in all seasons and weather, to carefully photograph the positions of the sun, Freeman found the rocks once thought to be simply strewn across the prairie instead mark the progression of the year with uncanny accuracy. The rising and setting sun on both the longest and shortest days of the year lines up precisely with V-shaped sights in the temple’s rocks. The spring and autumn equinoxes, when day and night are equal, are similarly marked. They are not the equinoxes of the Gregorian calendar currently used, however, but the true astronomical equinoxes. Freeman is convinced the temple contains a lunar calendar as well, because the 28 rays radiating from the central cairn correspond to the length of the lunar cycle. Mainstream archeology hasn’t been exactly welcoming. Despite being highly regarded in his own field, Freeman says journals have rejected his papers and conferences have denied him a platform. Professionals in any field resist interlopers from other disciplines and archaeology is no exception, he says. But he suggests conventional wisdom can restrict insight. Although he hasn’t read “Canada’s Stonehenge,” University of Alberta archaeologist Jack Ives is familiar with Freeman’s theories. He says recent research suggests some astronomical knowledge developed in Central and South America flowed north to the plains, where it was adapted by people for their own purposes. “There is some basis for thinking there was sophisticated astronomical knowledge,” says Ives. But what exactly is manifested in the medicine wheels? But Ives points out the terrain in question is an ancient glacial moraine, full of naturally occurring rocks. Freeman, however, is convinced. He looks forward to the academic debate to come. “I know my song well before I sing it,” he says, quoting Bob Dylan. Meanwhile, Freeman hopes to use any publicity generated by his book to push for preservation of the site. Part of it is privately owned, but most is Crown land and open to both the energy industry and casual, possibly destructive, visitors. Freeman is a man of science, trained to trust hard data and believe evidence over sensation. But after 28 years unravelling a message in mute stones, the wind in his hair and the sun on his face, absorbed in ancient mysteries, the site has come to evoke in him something akin to reverence. “I can go down there with a headache and within a day everything is gone. It’s just like a cure. There is something down there. I just don’t know how to describe it.